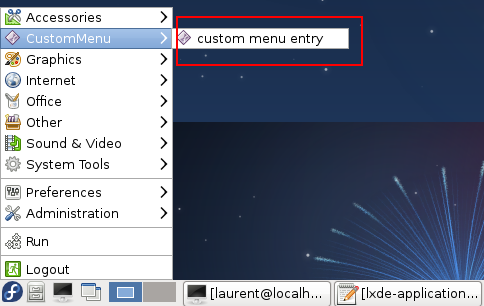 This is a follow-up to my previous post about adding LXDE start menu entries. So you are now an expert in the .desktop file format and you know how to create one and how to “link” it to one of the existing LXDE start menu sections (Accessories, Graphics, Internet, Office, Other, Sound & Video, System Tools). But what if you want to create a new section ? Or what if you want to add a sub-section to an existing section ? Well: easy as pie ! This translates to “the ‘Accessories’ section is described in the lxde-utility.directory file and a .desktop file will appear in this section if its category is ‘Utility’“. Said differently: “if you want your program shortcut it to be displayed in the ‘Accessories’ section, then create a .desktop file containing “Categories=Utility”“. If you are looking for the directory that contains the .directory files, it’s here: usr/share/desktop-directories. The <MergeFile> tag says that we are going to extend the existing /etc/xdg/menus/lxde-applications.menu configuration file. Our new custom section is configured in the ~/.local/share/desktop-directories/custom_menu.directory file. Each .desktop file containing “Categories=CustomMenuCategory” will belong to this new section. OK, we are now going to add a sub-section in the “Accessories” section. So what’s happening here ? 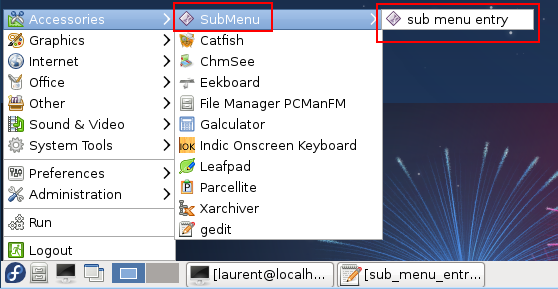 Well, we are nesting our new SubMenu under the existing Accessories menu. If you look at your existing /etc/xdg/menus/lxde-applications.menu file, you will see that you can use conditional expressions to define how your .desktop files are going to be linked to your menu sections. Means that a .desktop file will be linked to the “Accessories” section if its categories are “Utility” and not “System”. So “Categories=Utility;Foo” will link the .desktop file to the Accessories section, and “Categories=Utility;System” will link it to the “System Tools” section. You can also use the <Xor> tag, but I guess that you can easily understand how it works. Thanks for this article, I’ve been able to build multiple submenus from your information! Regarding the fact that you have to create an actual *.desktop shortcut file in order for a submenu to become visible, what if that *.desktop file is of Type=Link instead of Type=Application? I have not been able to get the Type=Link *.desktop files to make the submenus visible. Do you know if there is a way to do that? I realize this is a rather old post but would you know how to add an application to the top level? Similiar to the run command, and logout. Thanks for the post, it has some good detail. I am new the Linux and messing around with my Raspbian install. Sadly that didn’t work for me. As I can see it worked for other people, it should be I’m doing something wrong. I’m simply doing a copy-paste from your document. Are you aware of any changes in configuration since you posted this document?